Imperial Hall’s stunning terracotta facade is reminiscent of its glorious history when it used to be the Leysian Mission Building. The missionary was providing healthcare and education to the underprivileged families in the East London before the time of NHS and modern welfare. Its achievement was lauded by the Queen herself, who inaugurated the re-opening of the building in 1955. In the 80s, the building has been transformed into a residential development, which resulted in converting the grand concert hall into flats. In the process, beautiful stone and window details were sealed up in plaster boxes. Glorious foyers of the concert hall were left as meaningless hallways. Atelier Chang aimed at bringing back the initial state of the building combined with modern touch and convenience. We dug through the hidden layers of the history and brought them forward to our contemporary audience through transparency and framing. 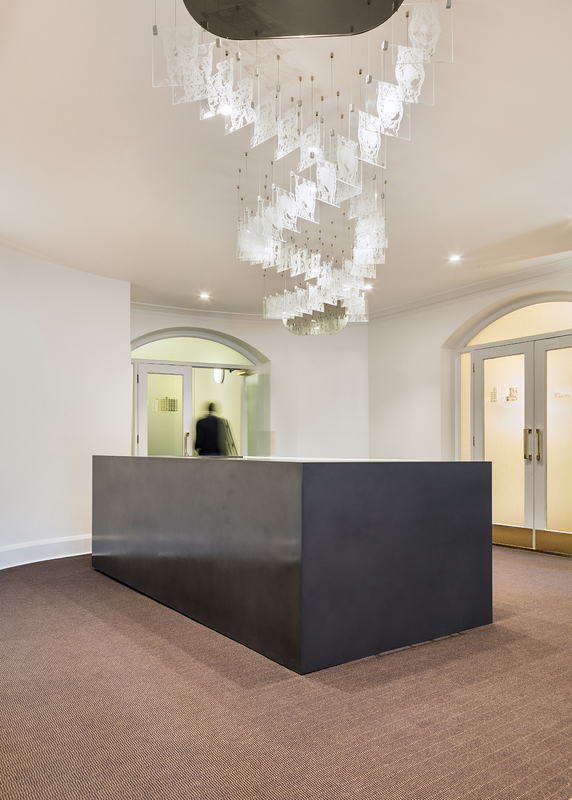 The new reception on the ground floor is centred on the metal reception desk. The desk reflects the surrounding context like an old black mirror. In its quiet reflective surface, the concierge sits in the centre to activate better communication between the residents. 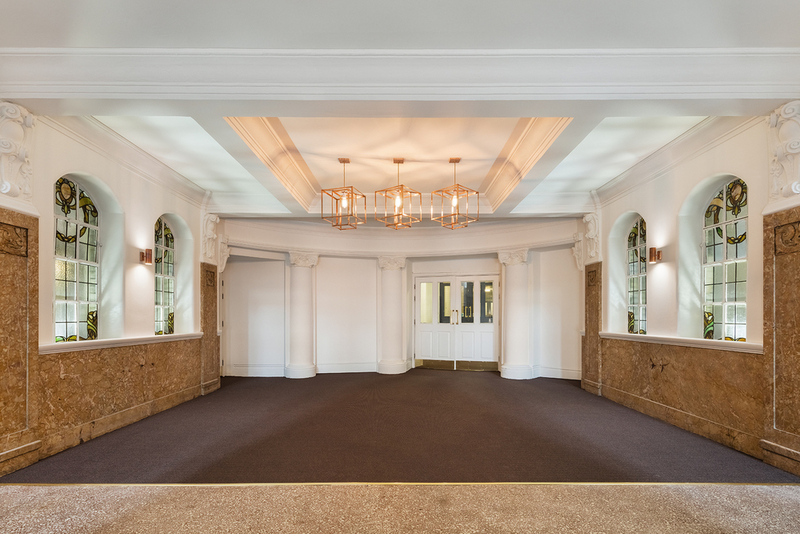 The resident are proud members of this new community: in fact, this refurbishment signifies how the current freeholder’s association (Imperial RTM) has fought against the developer to regain the full ownership in 2012 with those who care and cherish the building heritage. 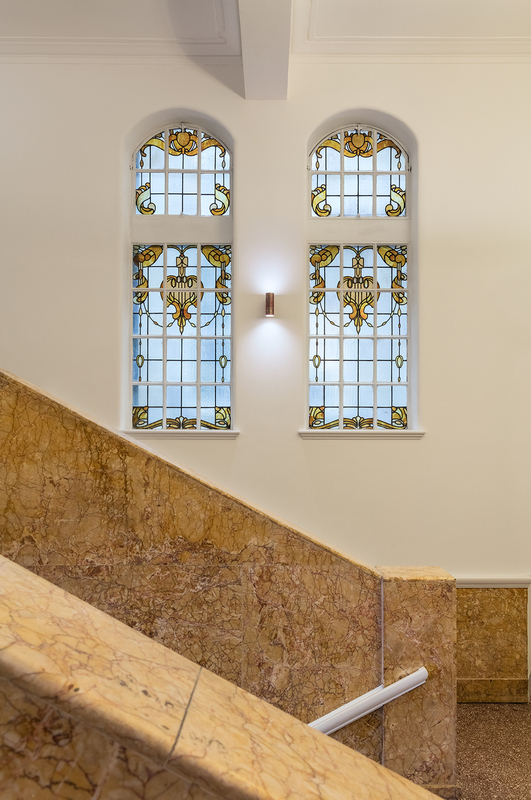 A glass art work was chosen to reflect the time when the missionary shared its resources to the poor to provide healthcare and welfare in old Leysian Mission Building. Titled as “Regeneration,” the series of glass panels are engraved sequence of MRI shots showing two bodies as the artist Bongsu Park (http://www.bongsupark.com/) donated her a third of her liver to her dying mother. The details of art work sheds new light onto the grand entry. Two glass frames stand on both sides of the reception desk as they illuminate the space with floor lamps. Each panels captures old images of the Imperial Hall like a contemporary art installation. It is composed of multiple panes of glasses creating 3D effect. One image is of the old Leysian Mission facade in 1810s and the other, the Victoria concert hall that used to host 2000 audiences. On the annex from the reception toward the post boxes used to be a dark corridor. 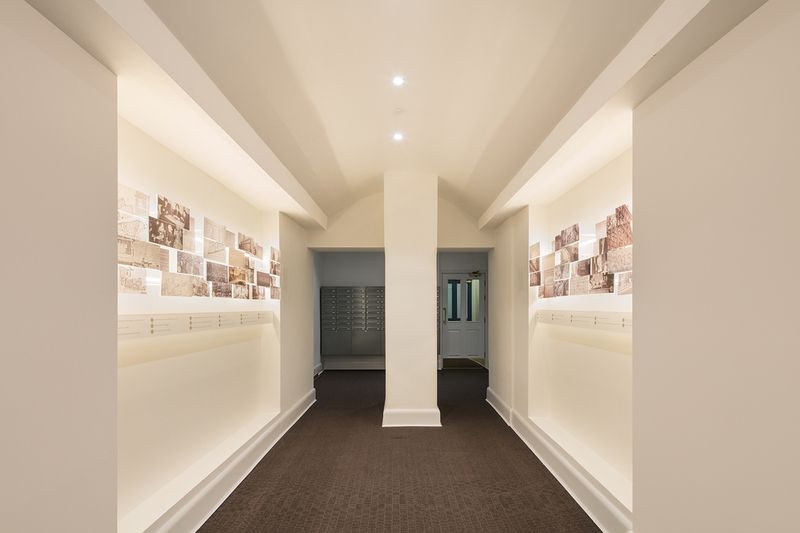 We proposed a timeline gallery to properly display the historical evolution of the Imperial Hall in its urban and political context. Inspired by the neighboring Brick Lane, we composed historical images in the form of transparent bricklayer. It portrays Leysian Mission as a host of the poor and the sick: children filling up the hall to get hot food on Fridays; 5000 people visiting the hall over the weekends. 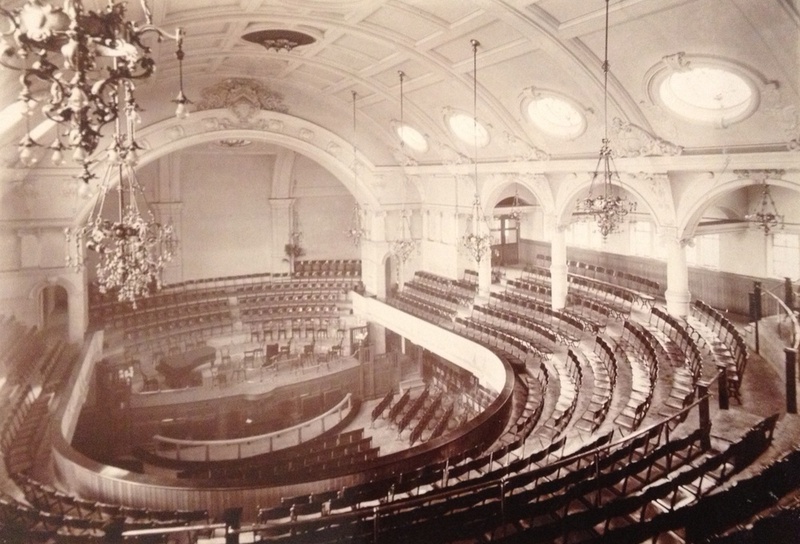 The Queen attended the opening ceremony for re-building of the concert hall cherishing such generosity in 1955. Above the reception was an empty space simply leading to other stairs and corridors. 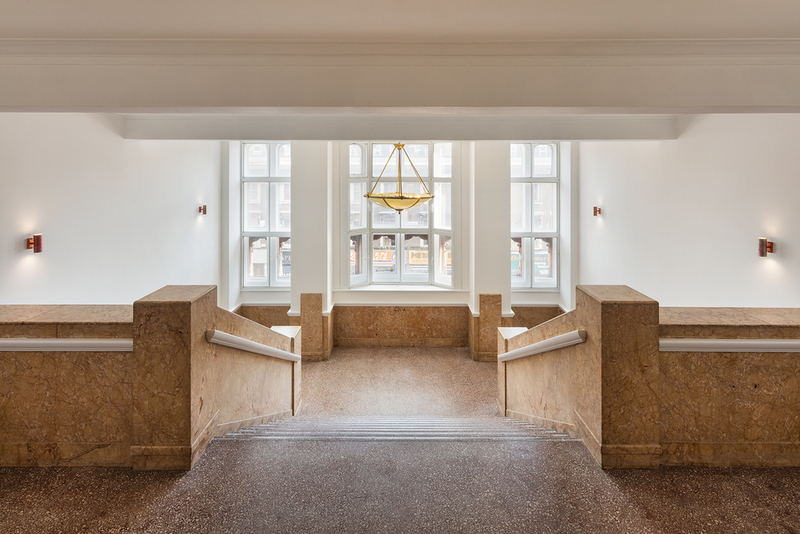 Niot many realizes that it used to be a grand foyer to the 2000-people concert venue “Victoria Hall.” We renamed the area as a Victoria lounge and peeled off fake finishes from the 80s and started to reveal its pure form. The focus was on the famous stained glass artwork by W. J. Pearce, which remained in darkness behind the emergency lights. By recomposing the light elements and applying minimal finishes, it regained its old elegance under new brilliance.